Well friends, I’ve finally done it. Done that simple thing that nearly all the adults in the world can do, that, well, most teenagers can do. That thing that I have been avoiding like the plague for over a decade. I learnt to drive. I spent the money, took the classes, practiced in our manual car, nearly broke up my pending nuptuals, but in some small miracle, I learnt how to drive. I’m feeling pretty pleased with myself. Jordan however decided to celebrating by getting a vicious flu. The kind that makes his workaholic self completely stop. He has probably slept for 20 of the last 24 hours. I on the other hand, am currently spending most of my days mind-over-matter-ing it, in an attempt not to get what he’s getting. And to aid in my attempt to refuse to allow bacteria into my body, I’m also eating kind of insane amounts of vitamin C.
Not just vitamin C though, the internet has led me to believe that I need not only citrus in IV form, but also garlic, ginger, and spicy food. 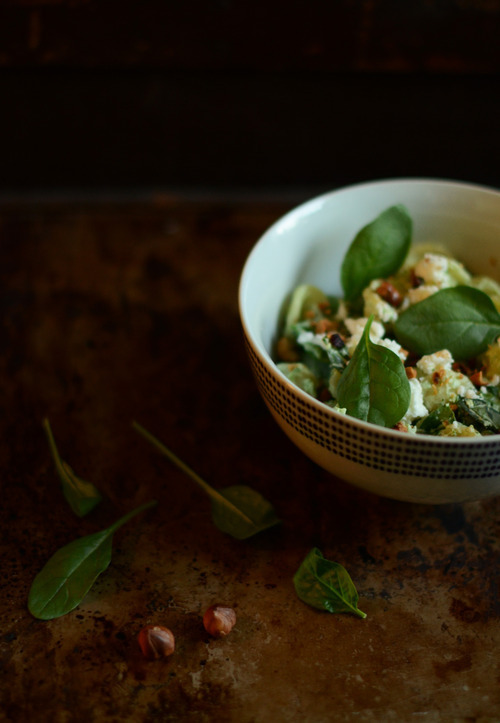 So here is the garlick-iest, ginger-iest, spiciest, and citrus-y salad you’ll ever need. It’s all the immune boosters in one so that we all don’t end up curled up in a ball watching terrible TV. I for one like to be in fine form when I watch bad TV. 2 stalks Celery, sliced on a bias. Bring a large pot of water to a boil. Season liberally with salt. 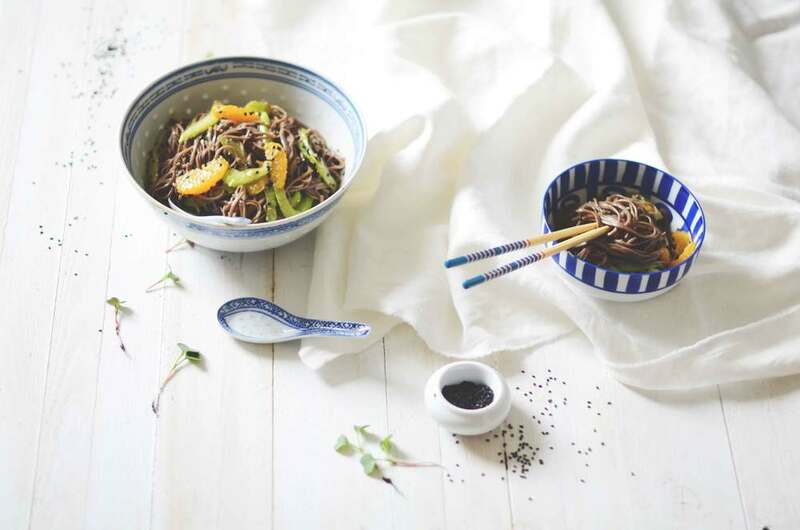 Cook soba noodles according to package instructions, or until al dente. Strain, and immediately pout cold water over top and woosh it around with your hands or a spoon to cool it all down. Set aside. Meanwhile, take your minced garlic put it near the edge of your cutting board. Sprinkle a small mount of salt on top. With the side of your knife, crush the garlic until it is pureed. Put it in a large bowl. Add in the ginger, lime juice, soy sauce, and chili sauce. Whisk to combine, then slowly add in the sesame oil. Taste, and add more citrus, oil, or soy as needed. Add in all the remaining ingredients. Toss to fully combine and serve immediately, or cover and keep in the fridge for up to 2 days. I mentioned this in my last post, and I feel a bit weird about announcing it over the internet, but here goes: Over the holidays Jordan proposed, and I said yes. It has been a magnificent couple of weeks, full of celebrating with friends and family. Jordan told me that the wedding is off if I go on a “wedding diet” and I assured him that it wouldn’t happen, because it can’t happen. Because everywhere I turn these days someone is pouring me a glass of bubbly, and then refilling it, and then refilling it again. Let me tell you friends, it is hard to stay sober when you’re recently engaged. So this post is against all the new years resolutions, and against the very principle of a wedding diet, because it is hang-over food. 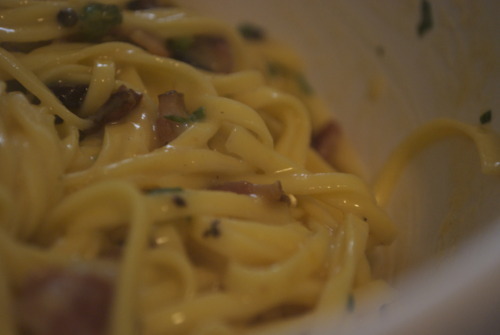 Spaghetti Carbonara, or “bacon and egg bascetti” as I used to call it when I was wee, it basically just that- bacon, eggs, parmesan, and loads of black pepper. You don’t need to cook the sauce, it cooks as the it’s tossed with the hot pasta. You can easily make this without the poached egg of course, but there is something about adding that makes the pasta feel like breakfast. Which is sometimes just the ticket. Cut the bacon into ½ inch pieces and cook them in a small frying pan over medium heat for about 15 minutes, or until they are crunchy, but not burning. Strain the fat off into a jar of can. Put the bacon aside. Fill a large and a medium sized pot with water and bring to a boil. 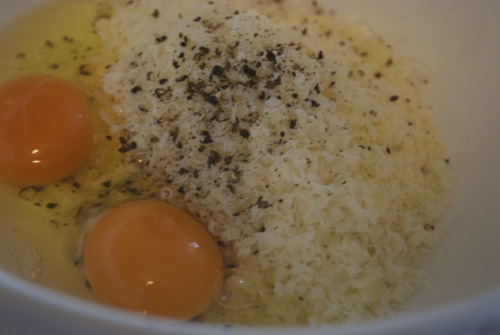 Meanwhile grate the parmesan and mix it in a large bowl with 3 of the eggs and healthy cracking of black pepper. When the large pot of water comes to a boil, season it liberally with salt and cook the pasta to the directions on the package. Just as the pasta is done and you’re about to strain it, crack the eggs into the remaining medium sized pot. Strain the pasta and add it, and the bacon to the egg and parm mixture. Stir vigorously until it has completely combined, making sure it doesn’t curdle. Using a slotted spoon remove the eggs from the water- testing to make sure they are done by gently poking at the yolk and white with your finger, ensuring that the white is hard but the yolk is soft. 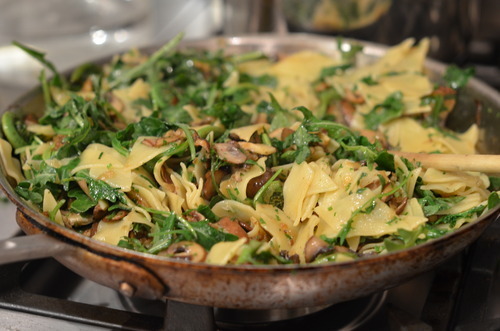 Put the eggs on top of the pasta and enjoy immediately! 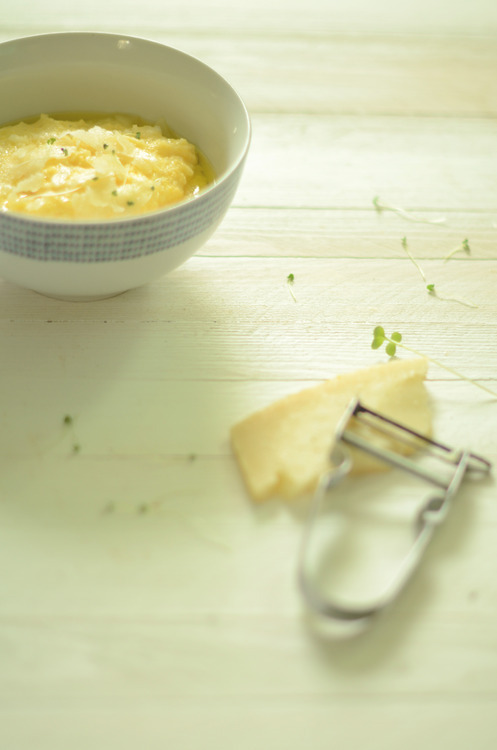 I love polenta. I love it a lot. It is, for me, the ultimate comfort food. It’s smooth and creamy and, perhaps most importantly is super cheap. I pretty well lived off of polenta for a couple years. Breakfast? Put an egg on it. Lunch? Some tomato sauce. Dinner? My favourite is with sautéed mushrooms and onions. You can serve it with steak, or Bolognese sauce, or darn near anything. But when I was young and ever so broke, mostly I ate it with straight up tomato sauce. When I was feeling rich I would buy some parm and add some in, but most days it wasn’t so fancy. I could make a big batch and feed myself for a few meals for under $3.00. Mega cheap. And, even in my intense poverty, it was a deeply satisfying meal. 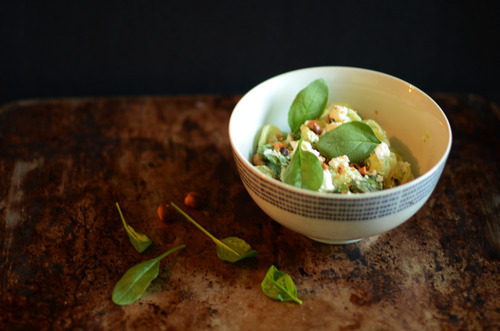 It takes only a few minutes to make and it is rich and as comforting as any dish could be. And it is almost ridiculously easy to make. It is a no fuss sort of a dish. You simply bring some liquid to a boil (stock, milk, or a combination of both) whisk in the polenta and let it simmer for half and hour or so. That’s it. Unless you’re trying to keep your costing at a minimum, you should add in cheese and a little nub of butter for a bit of flavour. 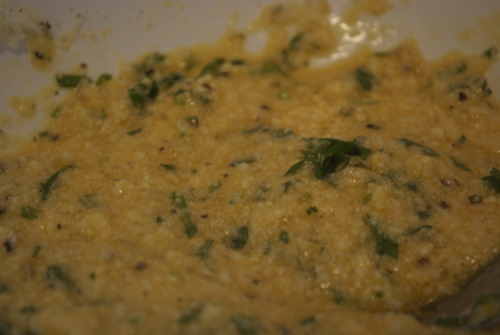 Once it’s cooked it becomes a creamy porridge, but your left over’s will harden up in the fridge and become something that you can bake or fry and give it some crispy texture. But I like it best hot out of the pot, eaten with a spoon, feeling like a kid again. In a medium pot over medium heat bring a pinch of salt, the stock/water and the milk up to a boil. Pour the polenta into a fine sieve and shake it over the pot whisking the whole time- this will prevent lumps from forming. 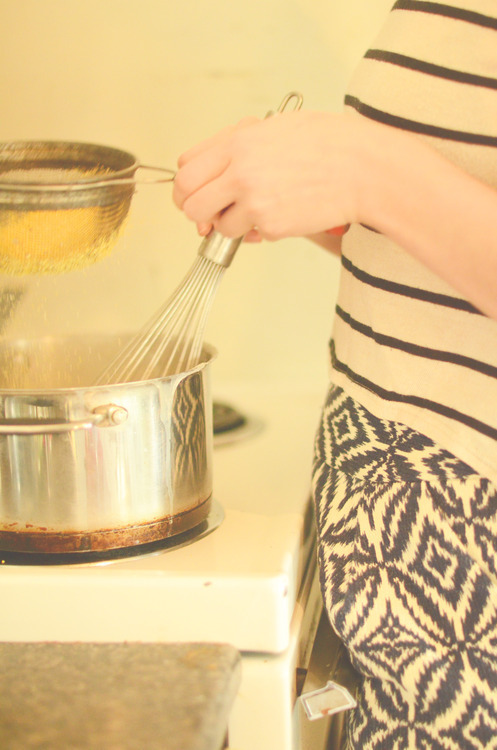 Keep whisking until the polenta starts to thicken, about 2 minutes. Switch from a whisk to a spatula or wooden spoon and stir on occasion for 25-35 more minutes, adding a bit of water if it starts to look too thick. Add in the cheese and butter and stir until it is totally incorporated. Check for seasoning and add more salt if you need it. I love pasta. I used to think I would be happy eating pasta every day. It is my ultimate comfort food. When I’m sick I want pasta, when it’s cold I want pasta, when I’m celebrating I want pasta, when it’s hot out I want pasta. I love pasta. Then I worked at a high end Italian restaurant here in town, that shall remain nameless, where we had pasta every day for staff meal. It was always spaghetti with whatever we had kicking around left over. Except that there was never anything left over, so it was always spaghetti with butter and parm. We also had a salad of leftovers alongside it, except there was never any leftovers, so he ordered in iceberg lettuce for us. It was a sad sad meal, and everyone who worked there was significantly plumper when they left than when they had arrived. It was a restaurant full of flaws, full of some extraodinarily cruel people, and full of beautiful food for the guests, and iceberg lettuce for the staff. I felt really crappy about myself when I worked there. And for quite a while I stopped eating pasta. I had just gotten my fill. Slowly though, it came back, and it ought to. I’m a tiny bit Italian and it manifested itself into my diet when I was very small and it never left. I love, passionately, food that uncomplicated, unfussy, that used very few ingredients, but uses the best ones possibly, to make simple beautiful food. That’s what Italian food is all about. Which brings us back to pasta. Pasta for me is the epitimy of simple food. The combination of essentially just flour, salt and eggs makes the most gorgeous textured noodle that, at it’s best, is just graced with a sauce made of only a very few things. It is simplicity done right. In a large bowl mix together the flour and salt. Create a well in the centre of it and add in the yolks, oil and milk. Mix together until it combines. Now put the dough onto a clean surface and knead it- push the dough out flat, fold it over and push it again with the base of your hand, pushing and folding over and over again. When the dough is ready you will be able to do the window test- Pull a small piece of dough and gently stretch it with your fingertips. If it is ready you will be able to get the dough to become so thin it is slightly translucent. If not and the dough rips, keep kneading. If you doubt at all whether or not it is done, keep kneading. When it is done, wrap it up in plastic wrap and let it cool rest for at least half an hour, or up to overnight. 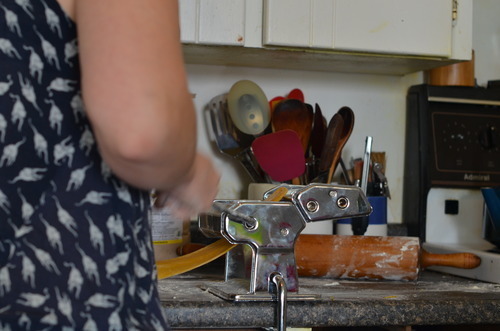 Once it’s rested set up your pasta roller. Cut the dough into quarters and cover the others carefully. On a very well floured surface roll out the dough by hand with a rolling pin to about 1/2 cm thick. On the pasta machine on the thickest setting roll out the dough. Now on the second thickest roll out the dough again. 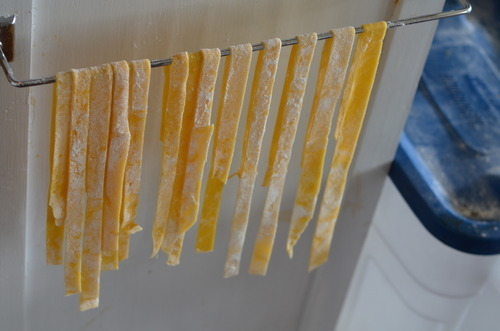 Keep going until the pasta machine is on setting number 3. Flour the dough again and fold it into thirds and cut into strips for linguine. Either coat them heavily with more flour and wrap them up to use within a couple days or while they are still soft hang them up. I used my towel rack, but you can also hang them up (clean) hangers and dry them that way. 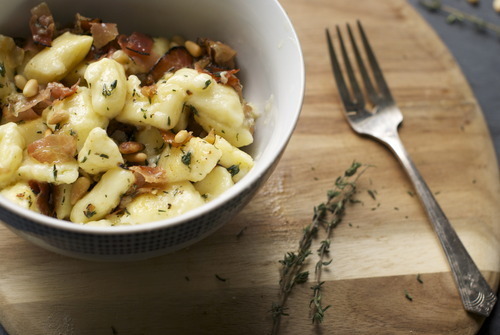 I wish that I had a cuter story about gnocchi. I wish my Nona had taught me to rice the potatoes, that she had shown me just how much flour you need to bring the dough together. I wish, to be honest, I could even remember her gnocchi, but I don’t. Although I’ve heard my mom and cousin talking about how incredible they were, the only time I remember her serving us gnocchi I also remember her apologizing for not making them from scratch. But such is memory I guess, flawed. So instead I learnt how to make gnocchi from reading the French Laundry Cookbook, where Thomas Keller goes to great length to explain how to make them. There are many ways to make gnocchi, and many debates on how to do it best, should you use starchy russets potatoes, or waxier Yukon golds? Should there be cheese added, or just on the top? 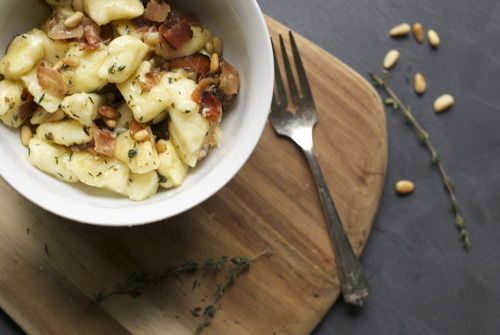 If you use another starch, a squash, or a sweet potato, is it still gnocchi? 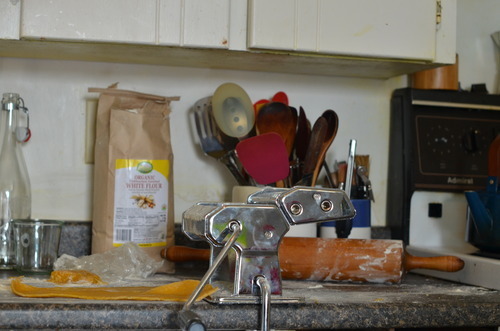 Over the years since I first forayed into the world of homemade pastas I have tried just about every possible method and every possible ingredient, and this is the recipe I always come back to. 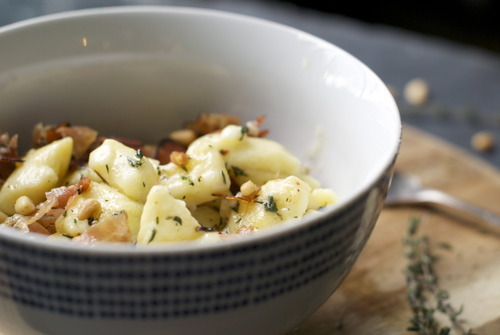 I use Yukon golds- waxier, so that you get more control over the starch content, no cheese in the gnocchi, it’s an unnescessary flavour, and it detracts from what is darn close to perfection to begin with. And you can call it a squash gnocchi, or a sweet potatoe gnocchi, but again- if it ain’t broke, don’t fix it. Gnocchi are surprisingly simple to make, you roast the potatoes, push them through a potato ricer or through a seive, to get very fluffy potatoes, and then you add in a few eggs and a touch of flour and knead it together until it barely forms, and then roll it, cut it, and boil it. It’s also wonderful because it freezes brilliantly, so if you make a bigger batch you can keep some for later. While it is simple, and just about anyone can do it, I should note that it takes a quick hand, and the first time you do it you should stick to a small batch and just practise the technique. Gluten, the protein in wheat, forms at 55C and you want the dough to come together before it cools down past that temperature, so you must work quickly and keep a cloth over your dough as you go. 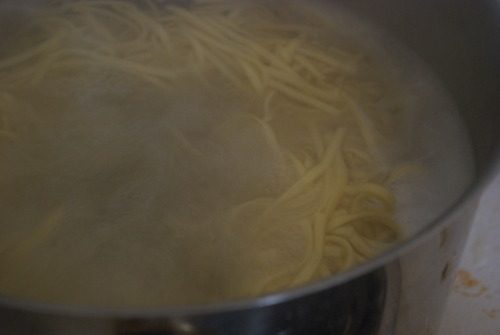 And always have a pot of water boiling so you can test the little pastas, and make sure the consistently is just right. Poke some small holes in the potatoes with a fork on every side, and then lay them on a baking sheet and bake until an inserted knife goes in and out without any resistance, about 45 minutes to an hour. As soon as the potatoes have cooled just enough to touch, put a towel over the rest of the potatoes, take one and cut it in half. Without peeling it, put it flesh side down in the ricer and press it in until no more potato comes out. Repeat with the rest. If you don’t have a potato ricer you can take a sieve and press it the potatoes through with the back of a large spoon, this is a bit more time consuming, but totally effective- I have done it many times. When the potatoes are all riced make a well in the middle of the bowl. Add in the eggs and a bit of the flour, and the salt. Mix until it has barely come together. If the dough is sticking to your hangs you need some more flour. Again add in a bit more and check again, making sure your hands are clean. One the dough is supple, but not sticky your in business. Take about a cup of the dough out. Put a tea towel over the rest. Flour the surface of your counter generously and roll out the reserved dough. I roll mine with both hands, and when it starts to feel a bit too long, I just cut it in half and do each hald seperately, the dough will break if you are too rough with it. With a pastry cutter or a knife cut the dough ito small logs. You can at this point roll them to get ridges on a gnocchi board or the back of a fork but I find this to be not too important. Now put them on a ery well floured tray and shake the tray a bit so that each piece is totally covered in flour. They will stick together if you are not diligent about thi. Now put a couple in your boiling water to test. If you haven’t added enough flour they may break apart. If they do just mix in another small handful. If they don’t keep going! 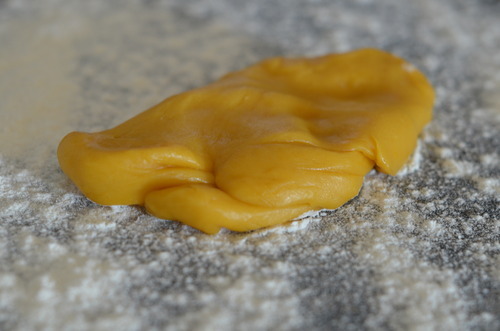 Repeat with the rest of the dough until you have lots of lovely little gnocchis all ready to go. If you are planning on freezing some/all your gnocchi put them in the freezer as they are on the tray covered in flour. After a couple hours take them apart and put them in a freezer bag and put them back. 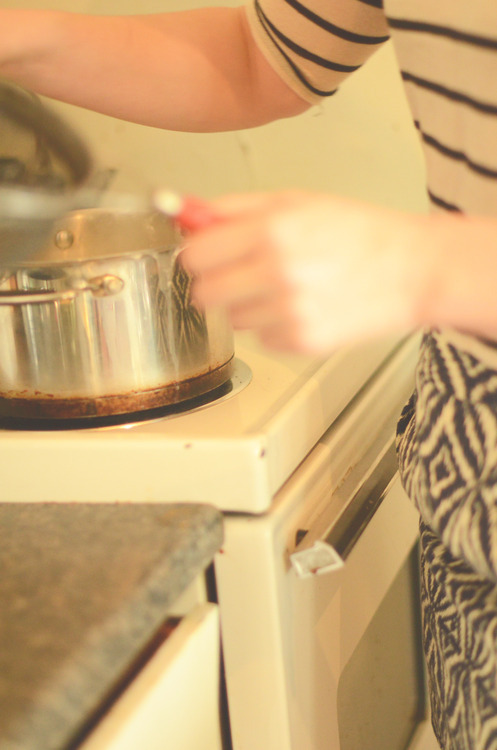 Bring a very large pot of water to a boil. If you are using frozen gnocchi use the biggest pot you have and do it in batches, otherwise they will bring down the water temperature too much and won’t cook properly. Salt the water generously and put your gnocchi in! 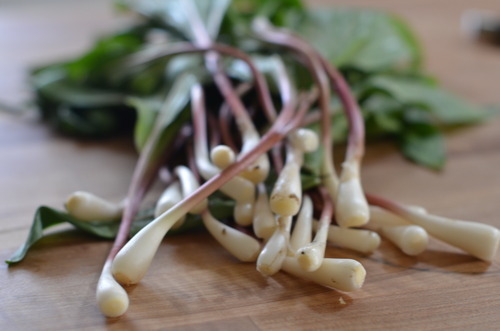 When they rise to the top they are ready to be put in your favourite sauce and eaten with abandon. Here I have sauteed some garlic and shallots in some olive oil, added in some pancetta, and topped it off with toasted pine nuts. 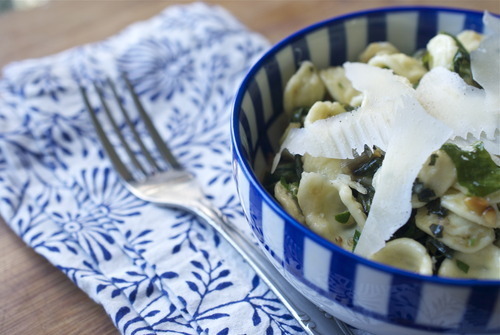 The simplest and most delicious dinner! For the wonderful people over at Edible Vancouver I did a little writing about swiss chard, pasta, and my over embellished Italian roots. Check it out here if your so inclined! Which is especially nice right now because we’re getting that first bout of bone chilling weather here in Van, and I do not want to be leaving my house for food. I want to hibernate. I want to drink hot chocolate, and apple cider, and read books and swaddle myself in knitted blankets. That’s what I want. What I also want it barley risotto. Risotto that warms you up form the inside out on a cold night but is healthy enough that I don’t feel to guilty about eating a cookie for breakfast the next day. Risotto that’s rich and soothing and is delicious with both grilled sausages and with sauteed salmon. 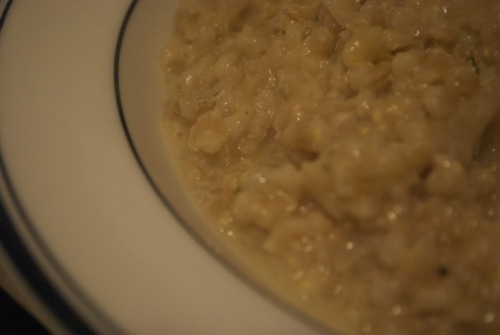 Risotto that is good heated up the next day because it’s not made of rice that gets soggy. 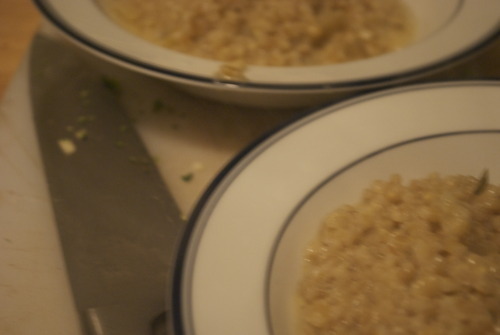 Risotto that has that nuttiness and bit of chew that characterized whole grains. Risotto that is just plain really good. Bring the stock up to a boil with 2 cups of water. Add a pinch of salt and then add in the barley and cook them to their package instructions, about 25 minutes. Meanwhile in a medium pan on medium-low heat warm up a good glug of olive oil. 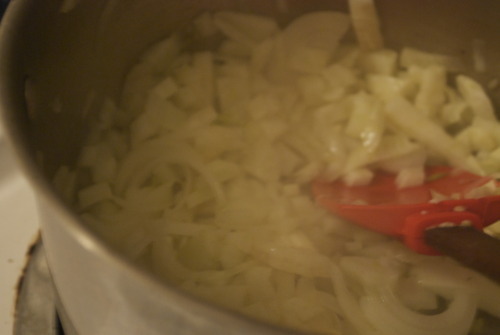 Add in your onions and fennel and saute until they become translucent and very fragrant. Add in your garlic and the herbs and cook just until you can start to smell the garlic but not so that it gets any colour. Add in the barley, the cheese and the knob of butter and stir to combine it all and check your seasoning. And then eat this wonderful mix by itself, or serve it as a side! They say that scent is the sense most linked to memory and I think, despite not knowing who they are, that they’re right. I think about it occasionally, if a man walks by wearing Jordan’s old cologne and I get a flash in my head of his old apartment, or the way freshly cut rhubarb makes me think of my mom making pie, but never is it more obvious to me then when I smell bacon. Bacon, which I have eaten literally hundreds of times in at least dozens of ways. But every time I smell bacon cooking all I can think of is a pale pale yellow bowl with thin red and blue stripes around the top of the inside. I can see it vividly, sitting on top of the glass tabletop from my childhood backyard, with our neighbours overgrown shrubs turning into trees in the background. I can feel the warmth of the hot Toronto summers, but mostly what I see is the Spaghetti carbonara inside that striped bowl, and what I smell is bacon. It was the ultimate summer meal, it took minutes to throw together, cook bacon, cook pasta, toss with eggs and pepper and parmesan, put on table. The speed of it was important not only because my Mom was a busy woman, but also so the burners wouldn’t be on and heat up the house. Good eggs are also crucial, and maybe most important is the parm. Try to get grana padano, or real parmesanno reggiano. And also, don’t skip on the pepper. 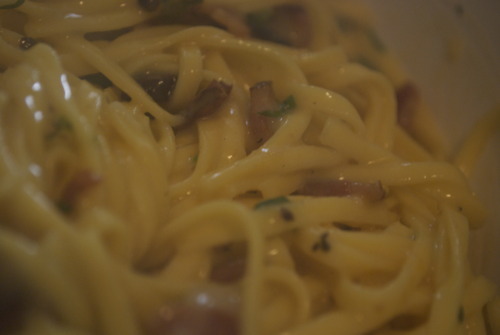 The name Carbonara means black, like coals, and though I don’t like quite that much pepper in mine it should have a fair bit. 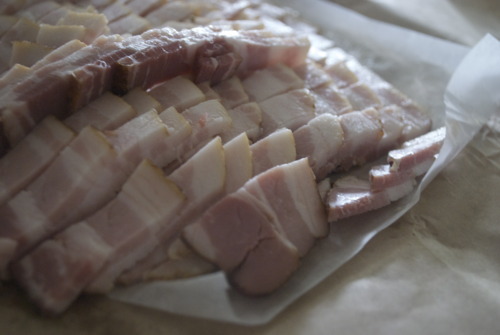 10 thick slices of the best bacon you can get. Pancetta is a lovely subsistute as well. 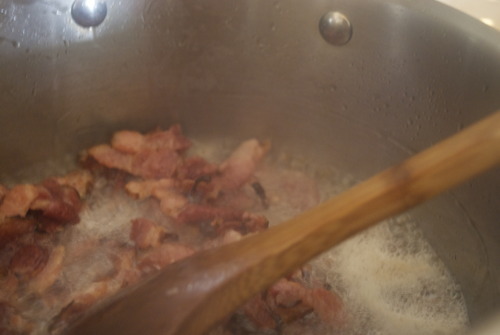 Cut the bacon into thick pieces. Fry them on medium heat until wonderful and crispy, but with a little chew to them still. Get a big pot of water on high heat. Meanwhile mix your eggs, parm and a healthy cracking of pepper. I was a little crazy this time and added a bit of parsley. You could do that too if you wanted. Now put that strange eggy sauce in the bottom of a large bowl. Now, perhaps you have a good stove and your water is boiling already. In that case, throw your pasta in, give it a good stir and cook it depending on the package instructions, but basically if until it is cooked throw with a bit of bite to it yet. If you don’t have a good stove, throw on some Aretha and dance around a bit, and then add your pasta, stir it a bit and cook it by the package instructions. Whatever works for you. Once it’s cooked strain it and then quickly put it into that big bowl with the sauce in the bottom and give it a good toss. You want to move quickly now. If you take to long the eggs with curdle, but if you move just fast enough you’ll have a wonderful silky sauce that wraps around each noodle. And it will be glorious.